It surely would have been to our advantage could we have visited this church half-a-century ago, for the so-called restorations of 1863 and of subsequent years, carried out in accordance with the spirit and notions of the period have removed many interesting features, and left but a glimpse and a suggestion of its former state. There are no ancient monuments to excite our interest, no heraldic devises, no painted windows, and very little architectural detail that is worthy of study. Neither will ancient records help us very much, for Upton came within the peculiar jurisdiction of Southwell—it was served by the collegiate church, being one of “the Ten villiagies and hambletis . . . Which have Chappelis of ease and be within the said parishe of Southwell.” Our local historians have therefore passed it by almost without notice, and included it in the chronicles of that important centre by which it was overshadowed. And yet the village is well worth a visit, for its church contains features which are rare, if not quite unique. The only visible remnant of the church which stood upon this site in the 13th century is the nave arcade, but I am disposed to think that it is not in a complete state, for the western respond is a clustered column, partly embedded in the walls. This suggests that the arcade originally comprised five bays, and that it was shortened by the removal of one bay when the tower was built in the 15th century. The tower arch is co-eval with the arcade; it appears to have been re-built to form the east wall of the tower, but the old work has been cut and chopped about until it is difficult to determine this point with any degree of certainty. The design and workmanship of this early portion—the keeled quatrefoil piers with moulded caps and bases, and what little there is of carving, bear unmistakeable evidence of the influence of Southwell—date c. 1250. It will be noticed that the carving on the boss at the intersection of the hood moulding over the central pier is unfinished; there is room for much speculation as to the reason why it was so well begun but never completed. A church chest in the chancel is probably a remnant of the furniture of this early church. Fifty years ago it was stowed away in a chamber in the tower, from whence it was brought in August, 1911, and restored to its proper position. It is a fine specimen of an early chest, 6ft. 3in, long, 2ft. 0in. wide, 2ft. 1in. high, made of thick oak boards, bound together and strengthened by ornamental bands of beaten ironwork, having chain and ring handles at each end, and hinged iron straps for three iron padlock fastenings. Near the top a slot hole now filled up was probably made for the admission of “Peter’s pence,” etc. ; a small oblong till being placed within the chest to hold the contributions. A sacristy or vestry is seldom found in connection with a 13th century village church. It was the custom at that time for the priest to robe himself before the altar, and for that purpose a large “hutch” or chest was placed contiguously for the safe keeping of vestments, ornaments, service books and documents. The corbel supporting the transverse arch across the aisle at the entrance to the chapel is worthy of notice; but I must confess that the purpose of the recess high up in the wall to the west of it has puzzled me. I am inclined to think that it is the mutilated remnant of a tabernacle for an image of the Virgin; it may have been a way on to the rood-loft, but if so, the re-building of the western portion of the aisle (1820) and the north porch (1869) has obliterated the approach to it. 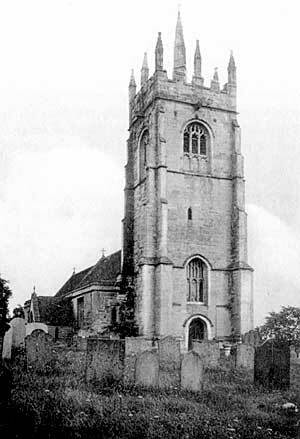 Upton Church – the hagioscope. 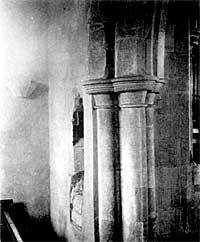 A hagioscope was formed by piercing the north wall of the chancel through the east side of this piscina, to the western jamb of the chancel window—a distance of 5ft. 6in. The necessity for this hagioscope is not so obvious now as it was in pre- Reformation days, when the elaborate screen-work, surmounted by a broad rood-loft stretched across the western end of the chancel; and the same remark will apply to the small lancet window, low down in the south wall of the chancel, which, I think, was provided in order to give light to a reader’s desk, placed beneath the loft. (1) Upton was enclosed A.D. 1796. Houses 66. Inhabitants 329. (3) “The arrangement by which a religious house became trustee of the chantry property was fairly common in Notts.”—A. Hamilton Thompson. (4) 1871, Vol. XI., p. 15. Lincolnshire Diocesan Architectural Society.